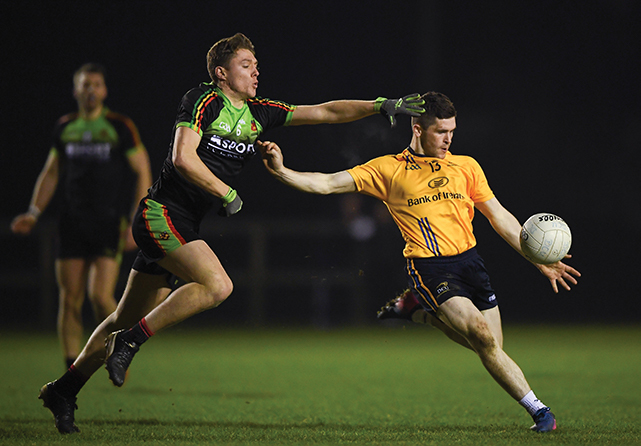 David Garland in action for DCU during the Sigerson Cup win over IT Carlow. UCD stormed away in the second half to beat DCU Dóchas Éireann by ten points on a torrential evening in Belfield. DCU had remained competitive with the reigning champions throughout the first half going in two points down at the break, 1-8 to 1-6. UCD made their move nine minutes after the restart when wingback Cian O’Connor palmed the ball to the net. Mayo’s Stephen Coen started the move for UCD with a neat ball into space in front of the DCU goal, finding the on running Conor McCarthy. McCarthy passed the ball on to Con O’Callaghan who fisted it across to O’Connor who finished this brilliant team move. DCU would only score three more scores for the remaining twenty-one minutes courtesy of frees from Brian Reape. The Southside University came out strongest at the start of the match with a fisted point from Barry McGinn followed by a nice free kick off the left boot of McCarthy. DCU were left reeling from the off, as the probing attack of McCarthy and O’Callaghan tormented the DCU defence. McCarthy ran down the centre of the DCU defence with O’Callaghan winning the penalty as he pulled on the ball along the ground. O’Carroll expertly slotted the resulting penalty to make it 1-2 to no score for the home team. O’Carroll and David Garland both added two points from frees for UCD and DCU respectively with UCD controlling the game with their danger men up front, McCarthy and O’Callaghan drawing fouls. DCU would not stand off as Garland grew into the match following one of his frees. Darragh Rooney passed the ball onto him and he rocketed the ball to the roof of the net giving Tommy O’Brien no chance between the sticks. O’Carroll added a free and a point from a narrow angle close to goal to his tally as the big full forward remained consistent from the placed ball. Reape got his night underway from a 30-yard free and DCU midfielder Thomas Galligan chipped over a nice free on the right with the natural arc, after interplay from Reape and Garland. Con O’Callaghan continued to torment DCU, forcing Evan Comerford to pull out a top drawer save before Darren Gavin slotted the rebound over the bar. O’Callaghan attacked up the right wing again moments later, jinking to make room for himself before confidently kicking the ball over in a piece of individual brilliance. Matthew Ruane was immense for the DCU challengers and a big booming effort from him from the 45 went over the bar to end the half on a high for DCU. O’Carroll got the second half underway, resuming his assured free taking from the ground. Con O’Callaghan added to his tally cutting inside from the wings to put the ball over the bar on his weaker left boot. DCU then scored their second goal from O’Connor which was directly followed by an inspirational score from Darren Gavin from far out which dropped over the bar. Reape kept DCU ticking over with a free but O’Carroll hit two from the spot from 35 yards out to keep the UCD lead at six points, 2-13 to 1-7. But the writing was already on the walls for DCU who now sought to come back into the game by moving midfielder Galligan in to the square accompanying Reape to go route one. UCD kicked on though, a blistering 60-yard run from goal scorer O’Connor gave room to O’Carroll in front of the goal to swing over an easy point. Two more consolation frees followed for Reape to leave DCU trailing by eight with two minutes to go. Gavin showed no signs of tiring for UCD. The big midfielder soloed the ball in to the DCU goal for a fisted point and followed it up in the next play to kick a monster point on the run off his weaker left boot. UCD now progress to the semi-finals where they will face St Mary’s in a repeat the 2017 Sigerson clash. UCD scorers: E O’Carroll (1-8, 1pen, 6f), D Gavin (0-4), C O’Connor (1-0), C O’Callaghan (0-2), C McCarthy (0-1, 1f), B McGinn (0-1). DCU scorers: B Reape (0-4, 4f), D Garland (1-2, 2f), M Ruane (0-1), T Galligan (0-1), M Bannigan (0-1). Image Credit: Harry Murphy / Sportsfile.